Kindergarten welcome Power Point This is what I plan to show to my parents and students during “Meet the Teacher.” I am so excited and can’t wait to meet my new bunch of smiling kiddos! 9 Favorite Quotes-Do you see your favorite? Please add your favorite quote, if you don’t see it on my list. Thanks! If you don’t have a favorite that resonates with you, then sit back and be inspired! Have you seen Sid the Science kid, yet? The first time I saw my six year old watch this show on PBS, I saw how involved she became. The characters are interactive and when I watch the show, I learn something new about Science. It is amazing to see these students in the classroom and home setting. In the classroom, the teacher shows the children the steps of the scientific method: “Observe! Compare! Contrast! Describe!” Scientific journals are also used in Sid’s classroom. I get some great teaching ideas from Sid. I am grateful that PBS has created such a wonderful learning experience for our youngest scientists! There are even games that go along with each topic. I just played the weather game. I had fun spinning the weather wheel and then dressing up the character with appropriate clothing! 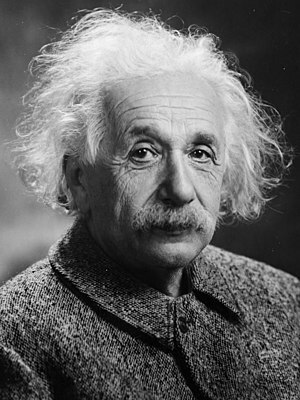 You can even sing 1-2 minute video song clips about his Science topics. What I like the most is that this program and interactive website meets children where they are at. It encourages critical thinking by asking higher level questions, like why? and how? Sid models collaboration as he engages in problem solving discussions. The children are engaged as they learn from Sid! Most of the games on this site can be played on the interactive whiteboard as well. Sid has an “Investigations” clip video where a real class makes applesauce. 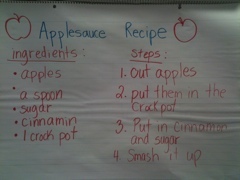 Our class viewed the short clip from http://www.pbskids.org and watched how the students figured out the best way to use heat to make applesauce. We then decided that we needed ingredients and a recipe. So, for shared writing, I wrote what they children shared! Then, I had each student then cut up about ten apples. They did it with plastic knives and has so much fun! 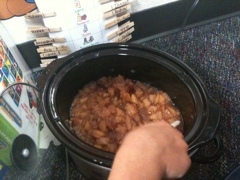 They then added them to the crock pot along with sugar, water and cinnamon. We cooked it from 10am to 2:30pm on high heat. At 2:00, I let them each stir and mash the cooking apples. 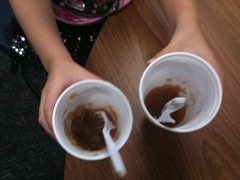 Then when the applesauce was ready, I scooped it into a cup, gave them each a fork-and they enjoyed. Every single student enjoyed eating it! I can’t wait to do it again next year! This is what the apples looked like at 2:00. Yum! This is how we enjoyed eating our applesauce! Here is our shared writing poster. Brain Pop Jr. is a great online tool for teaching! So, there is a catch. Daily video’s are free. To view everything, you must subscribe. I never had to pay a dime because our PTO paid for it. You may even could write a grant to cover the costs. It is worth every penny, though. If my school ever stopped paying, I would do it myself. I cannot imagine teaching Science or Social Studies without brainpop jr.! 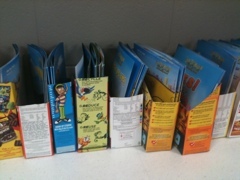 These are cereal boxes that I cut, and I plan to use them for my book boxes in my classroom. 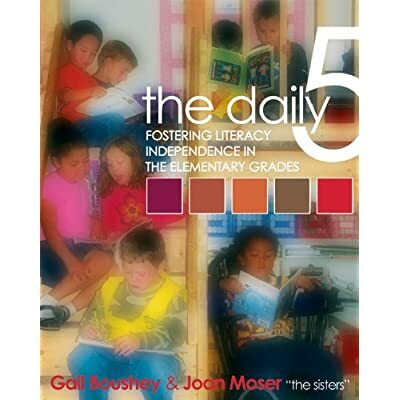 “The Daily 5” book is a great teacher resource, that gives simple ideas about how to instill more reading into your classroom routine. I have only used “The Daily 5” for one year, but I love it and am excited to use it even better this school year. Last year, I used magazine file boxes, that had been given to me-brand new. They did end up falling apart, and I had to tape the bottoms up with book tape. But they lasted for the school year. However, I did not want to go through the same thing again and decided to make my own book boxes-for free. I just need at least 15 more boxes to start out the school year. My parents and family have been instructed to save them up for me! 1. Read to Self– This is silent reading time. Last year, I began the first 15-20 minutes of the day with silent reading. 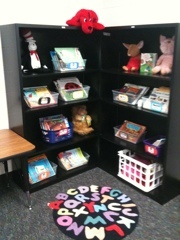 The students used their book boxes to read. 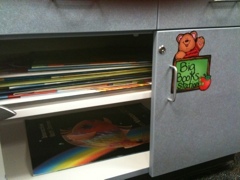 Every book in the box was on the students’ reading level, with nothing too hard or too easy. I allowed students to change books out every few weeks. 2. Read to Someone- This can be buddy reading or reading with a partner. 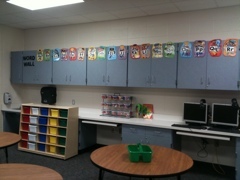 I incorporate this step into my Reading Center, where there are usually 2-3 students at a time. I think that the more students read, the better readers that they will become, as a result. 3. Listen to Reading– I incorporated this into my daily read-alouds. Since I love reading and I love reading to children, I usually read about 2-3 books a day to students. I believe that when children hear more reading, they enjoy more reading. 4. Work on Writing– I this into my Writing Center, where I have pre-stapled books available for students to write and illustrate their own “little books.” Last year, this was the most popular station in my classroom! Writing develops reading skills too! 5. 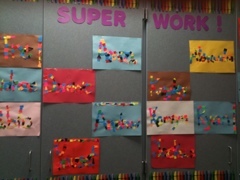 Word Work- I also make this a Center station. I change the activity every 1-2 weeks. 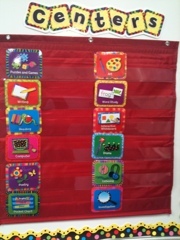 This is where I include activities for the phonics skill, which I work on during Guided Reading groups. So, if the skill is -at words, th- words or beginning sounds-I place an activity about it here. I am excited to use The Daily 5 again this year! Here are the boxes-filled with books! I absolutely love books! I always teach my students that books are like money-so treat them well. As a child, I always enjoyed reading as a hobby, but I developed a love for books because of my seventh grade teacher, Mrs. Dalyrymple. She was always bringing in a new book to read, that she had just bought at a second hand book store. I don’t even remember any of the books that she read, but I do remember her excitement and joy that came from reading a book aloud. As a teacher and mom, I can’t help but do the same thing. Books excite me-especially when I find one for less than a dollar at the Goodwill store. I hope that I awaken a love for books and learning, within my students too! Here are some of my favorite books, that I love to read at the start of a new school year! This is my newest favorite. 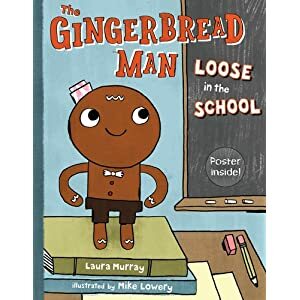 It is such a cute story about how the classroom of students made a gingerbread man and then went out to recess. When they came back-he was gone. Now, they must search the school to find him. Along the way, he is out searching and meets the staff a the school (the nurse, principal, librarian, coach). It also comes with a poster of the cute gingerbread man from the book, which has a black and white copy to reproduce for your kiddos! I want to use props this year to let students help me act out the story (lunchbox, sandwich, mouse stuffed animal). I think it will be very interactive this way. I like to think-aloud as I read this lovely story, and have the students help me compare the Kindergarten classroom in the story (full of animals) to our classroom. This is the Reading Station. Each basket is sorted by theme based on the books that I own (fairy tales, Dr. Seuss, Eric Carle, Jan Brett, animals, insects, ABC and numbers. I also have animals and hats for role playing. 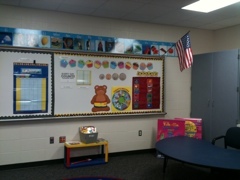 I traced some puzzle pieces (floor puzzle) to make this bulletin board. 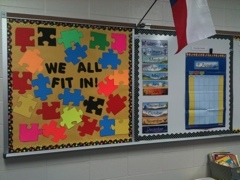 Once I get my student roster, I will be writing each child's name on each puzzle piece! These cute ABC kids signs are from Lakeshore Learning store. I will be ticky-tacking the sight words under each letter, as I introduce them. 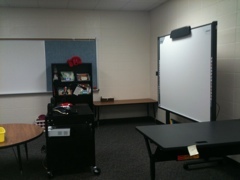 This is the Hitachi interactive whiteboard that I have for student use. Check out the cool laptop cart, to go along with it (complete with projector)! 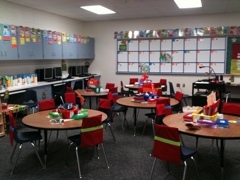 This is the Guided Reading group table-where all the phonics magic of reading will happen! I got these cute Center/Workstation labels from Teacher Heaven. 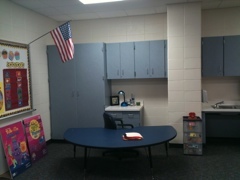 I plan to assign 2 students per station, to minimize behavior problems. My new easel arrived! It is magnetic. I plan to use it for my morning message that I write to the students each morning. 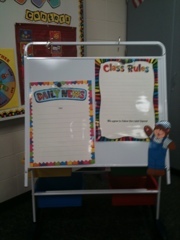 The rules poster will be completed as a class together. Then each student will sign on the bottom. 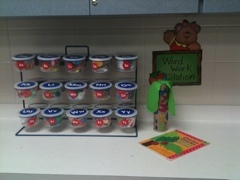 My school bought these nice letter/sound tubs from Lakeshore Learning. They have cute little objects inside, for each letter. The tree you see was made out of a Pringles can, felt leaves that I cut out and glitter sticker letters that I got from Wal-Mart. I ran out of shelves, so I placed my puzzle center under the Calendar area board. 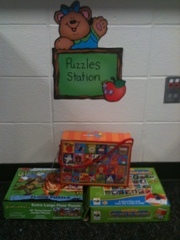 The students will be making the puzzles on the floor anyways! 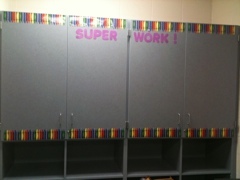 I will be hanging student work here! My big book station is tucked nicely on a shelf with the books laid flat.